The incisors of the Alaska marmot are sharp and chisel-like and grow indefinitely throughout life, which is characteristic of rodents. The Alaska marmot is a large, ground-dwelling rodent. It has a heavy body with short neck and bushy tail, powerful legs and feet, and claws well-suited to digging. An adult pelage (coat) is solid black on the dorsal surface of the head and nose, and gray and light brown elsewhere on the body. Distinguished from hoary marmot by its darker face and rump and much softer fur; it also lacks the white patch on the snout. In addition, dorsal guard hairs have a tri-colored banding pattern, feet are lighter in color, and ventral color appears dark gray. The incisors are sharp and chisel-like and grow indefinitely throughout life, which is characteristic of rodents. The thumbs of the front limbs have a flat nail, whereas other digits have claws. The Alaska marmot produces a high-pitched warning call, similar to the loud whistle of the hoary marmot. Body size of the Alaska marmot fluctuates during the year because of hibernation. A marmot leaves its winter sleep very thin but quickly gains weight, with fat stored for hibernation making up 20% of its body weight at the end of summer. Marmots are most active in early morning and late afternoon, although they may leave their burrows during other daylight hours. Marmots need wind to control mosquito levels and rarely venture out on calm days. The Alaska marmot marks its territory by rubbing its face and glands on rocks and along trails. Individual Alaska marmots reach sexual maturity at 3 years. Males mate with one or more females living in their territory, once per year, usually in early spring while still in the den. Litter size is three to eight and offspring are born in late spring to early summer. Female marmots give birth after a gestation period of roughly five weeks in an underground, excavated den. Pups are born naked, toothless, and helpless with their eyes closed. Around six weeks of age, the young have dense, soft fur, and are independent enough to explore outside the den. Offspring live and hibernate with parents for two years. The Alaska marmot is predominantly herbivorous. It generally creates its burrow near food sources of grasses, flowering plants, berries, roots, mosses, and lichen. These food sources may count for up to 20% of its body weight stored for hibernation by the end of summer. Alaska marmot inhabits the northern reaches of the state and can be found in the Brooks Range of northern Alaska from near the coast of Chukchi Sea to at least the Alaska-Yukon border. The Yukon River forms the southern limit of the Alaska marmot’s range and the boundary between the distribution of Alaska and hoary marmots. While they are primarily found in Brooks Range, the extent of the geographical distribution of Alaska marmots is poorly understood. There are records of Alaska marmots from Cape Thompson and the Lisburne Peninsula at the far-west extent of its range; the Endicott Mountains, Fortress Mountain northwest of Anaktuvuk Pass, Slope Mountain near the Dalton highway to the north, the south end of Lake Schrader and the Hulahula River in the northeast, and near Arctic Village in the southeast margins of its range. This species’ range has been extended south of the Brooks Range with specimens (held at the University of Alaska Museum of the North) from the Kokrine Hills and the Ray Mountains northwest of Rampart. These specimens — and observations made in 2007 in the Ray Mountains by UAM researchers — documented Alaska marmots 400 km south of the Brooks Range. Alaska marmots are social creatures and live in colonies, all sharing an immense burrow system. Dens may be located in extensive boulder fields, rock outcroppings, or active talus slopes with large rocks adjacent to productive tundra. Rocks must be large enough and accumulated to a depth sufficient to give subsurface protection. Shallow accumulations of boulders or slides of any depth that have been completely sealed in with vegetation are uncommonly used, nevertheless, stabilized rock fields and lateral moraines in mountain slopes in the later seral stages of succession are inhabited. Dens are often located near an observation post, such as a tall rock or cliff edge, within 10 m of the entrance. Dens are created by burrowing into soil under rocks. Summer dens have several entrances and are lined with grass. Winter dens have a single entrance on a windswept ridge that becomes snow-free in early spring; Alaska marmots plug the entrance with dirt, vegetation, and feces once all members of the colony are inside the den (usually by September) and hibernate through the winter. No animals leave the den until the following May. Winter dens are relatively permanent for each colony, and some have been used regularly for at least 20 years. Population densities are largely unknown, but suspected to be stable. Population trends are unknown, but suspected to be stable. 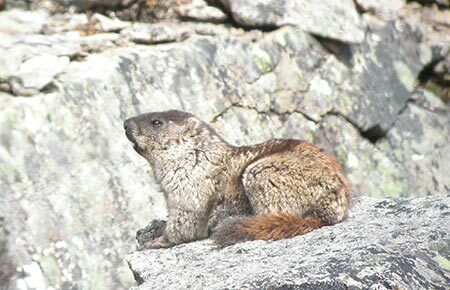 The relative inaccessibility of the Alaska marmots range has hindered study. 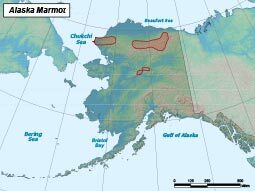 Potential concerns for Alaska marmots include vulnerability to natural and human-caused impacts as a result of low population densities and patchy distribution. Alpine-restricted and mountain-dwelling animals have been suggested as being particularly sensitive to climate change. Although the overall effects are unknown, this species’ alpine tundra habitat may be retreating as a result of global climate change. Common predators include wolverines, wolves, foxes, bears and raptors. Eagles are principal predators of juveniles. Mating occurs once per year in early spring. Females give birth to litters of 3–8 young in late spring to early summer after a 5 week gestation period.